Chennai Metro Rail Limited, Chennai notified for Walk-In-Interview for the Posts Asst. Manager (Transport Planning), Architect, Engineer (Tunnel) in Chennai. 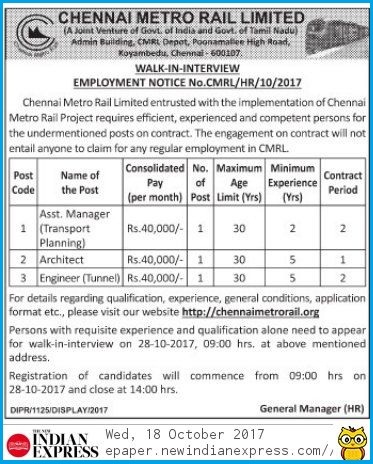 The Chennai Metro walk-in Notification Published Today 19.10.2017. The Walk-in-Interview Date will be 28.10.2017. CMRL Walk-in-Interview posts Notification, Number of Vacancy, Eligibility, Ager limit, Qualification, Selection Procedure, Application form and Complete Details you can get here download. All The Best. Age, Qualification & experience stipulated above should be as on 18-10-2017. Age may be relaxed for deserving and experienced candidates. Apart from the consolidated pay, benefits like Medical & Accident Insurance will be extended. Persons with requisite experience and qualification alone need to appear for walk-in-interview on 28-10- 2017, 09:00 hrs at above mentioned address. The number of vacancy indicated above may increase or decrease based on the requirement of the project. Registration of candidates will commence from 0900 hrs on 28-10-2017 and close at 1400 hrs. Must be a B.Arch. graduate from a recognized Institute. Should have minimum 5 years of post-qualification experience in the field of Architecture design in large Infrastructure project preferably in Metro Rail Projects/Railway Projects. Candidate must possess graduation in Civil Engineering or Equivalent from a reputed University/Institute recognized by Govt. Should have atleast 5 years of work experience in Railway Environment in construction of Railway Tunnel for Board Tunnel, C&C Tunnel and NATM with Geotechnical Experience/Knowledge. The selection methodology comprises two-stage process, interview followed by Medical examination. Registration commence from 0900 hrs and close at 1400 hrs on 28.10.2017. The News Paper TNTCL Assistant Job Notification, Indian Express Dated 19.10.2017.